The DC Comics: The New 52 base set includes 61 cards. Chase sets include "The Lanterns" (featuring iconic Lanterns), "Work In Progress" (featuring lenticular sketch to full-color), and sketch cards of some of DC Comics' most popular characters drawn by leading artists (1:24 packs). 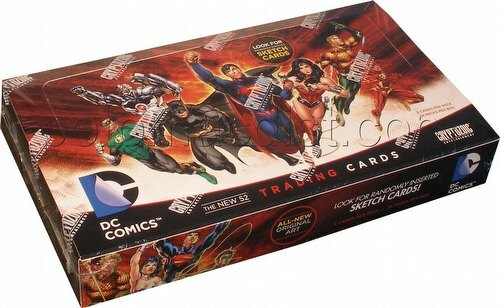 All cards in the base set contain original art commissioned exclusively for the DC Comics: the New 52 set.